Q: How often do I need to charge my Mobility Scooter batteries? A: Charge it over night after each time you use the Mobility Scooter using the supplied battery charger. If you are NOT using your mobility scooter for a long period of time, then charge it once a month for 12 hours, to maintain the charge. Q: How long should I charge my Mobility Scooter? A: You should charge it for at least 12 hours. Note when the green light on the charger comes on, the battery is about 90 to 95% charged, and should be left on for a further 1 to 2 hours. 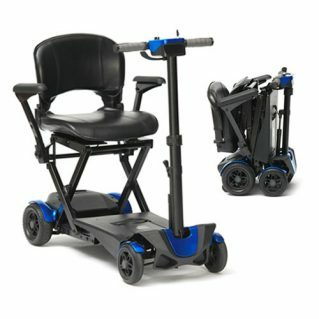 Q: If I leave my Mobility Scooter on charge for a day or more, can it damage the batteries? A: No, the charger will switch itself off internally once it is fully charged. If left connected to the charger, (with the mains power switched on) for a long period of time (2 weeks plus) then the charger will keep the battery charge topped up. Q: If I have finished charging my Mobility Scooter do I need to disconnect the charger? A: I would always recommend switching off and disconnecting the charger at the end of a charge. Due to some chargers are prone to discharge the batteries if only the mains are switched off and the batteries are left connected to the charger. Q: Can I use a car battery charger to charge my Mobility Scooter? A: No, it will damage the batteries. Q: How much will it cost to charge my Mobility Scooter batteries? A: Depending upon the size of your batteries, the charger is only 36 to 96 watts which at 16 pence a kwh and a 12 hour charge would be about 7 to 18 pence per charge. Q: How far can I go on a single charge? A: The distance given in your user manual is for, a flat run with a new scooter with new batteries and no head wind. And probably could never be achieved in normal use, I always quote about 2 miles less than the distance in the manual.